Nothing is quite as stylish as putting on a new pair of sunglasses. The right frames can boost your confidence, make you feel great, and match your unique sense of style. But sunglasses are about more than just looking good. In fact, they can be the most effective way to protect your eyes from harmful UV rays that can cause a wide range or eye conditions, including cataracts, macular degeneration and even vision loss. With that in mind, here are the six things you should look for when purchasing a new pair of prescription or non-prescription sunglasses. Be sure to look for sunglass lenses that provide full protection against ultraviolet light. A quality pair of sunglasses will usually have a label or sticker on it indicating that it blocks 99-100% of all UVA and UVB rays and that it meets ANSI Z80.3 blocking requirements (this refers to standards set by the American National Standards Institute). You should also look for lenses that have UV 400 protection. This means your sunglasses are able to block light rays with wavelengths of up to 400 nanometers, protecting your eyes from even the smallest UV rays. If you're someone who spends a lot of time driving or out on the water, polarized lenses are a great option. That's because these types of lenses reduce the glare that's reflected when light rays bounce off surfaces like water, the hood of a car or the surface of the road. The only downside is that polarized lenses can make it difficult to read your cellphone or digital device. Also, bear in mind that polarized lenses disperse glare but not UV rays, so make sure that any polarized lenses you do buy also have built-in UV protection. Most people think that the colour of their sunglass lenses is all about fashion. In fact, the hue of your lenses can actually have an impact on how your sunglasses perform—particularly when it comes to seeing colours. Yellow or rose tinted lenses for example, can make it difficult to distinguish changes in traffic lights. Instead, go for a grey, green or brown lens hue, which tend to minimize colour distortion and are a better choice when driving or boating. When it comes to UV protection, wraparound sunglasses offer the most protection. That's because they block both glare and UV rays that hit your eyes from either side. Go for wraparound sunglasses with large lenses and wide temples that come down to your cheekbones. Wraparound sunglass frames also now come in a wide range of styles and major brands, so chances are you can find a pair that matches both your vision needs and personal fashion sense. The old saying that you get what you pay for definitely applies when it comes to sunglass lenses. Inexpensive non-prescription sunglasses (like the kind you'll find at a drug store or street vendor) are likely to contain cheaply manufactured lenses that don't offer UV protection. 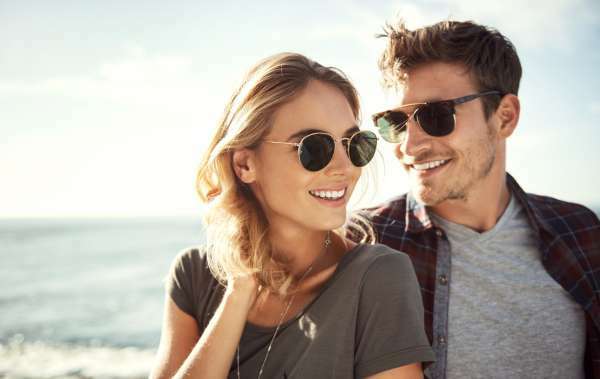 If you do require prescription sunglasses, consider going with a higher grade of lens, such as those made with Internal Freeform technology, that offer both UV protection and allow you to see more clearly than with other lenses. Ensuring your eyewear fits comfortably and correctly is always important, but doubly so for sunglasses since they're going to help protect your eyes from damaging UV rays. Ensure your sunglass frames fit snugly along your nose and ears without pinching or rubbing your skin. To prevent UV rays from hitting your eyes from above, also be sure to choose a pair that fits close to your face around the brow area, but not so close that your eyelashes are hitting the lenses. Most optometrists will also offer custom fittings to ensure that your new sunglasses fit perfectly. To find a great pair of prescription sunglasses featuring customized Internal Freeform technology, visit an FYidoctors near you.